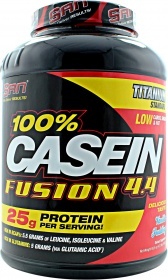 Use coupon "APRIL-10" on 100% Casein Fusion 4.4 1982g and save 10%. Achieving success in your muscle-building activities requires the right kind of protein, and the correct timing of your protein intake. While whey protein is prized for its fast-absorbing properties, it does not have the ability to provide your muscles with a steady supply of amino acids over long time periods. For round-the-clock muscle-building support, what you need is 100% Casein Fusion 4.4. Casein Fusion 4.4 provides your body with a massive 25g of its Custom Protein Matrix (Micellar Alpha & Beta Caseins and Caseinates, and Undenatured Milk Protein Concentrate). This protein blend is designed to provide your muscles with nutritive support that lasts for up to 7 hours after consumption – making it an excellent protein shake to take before going to bed or for starting the day. Each serving of Casein Fusion 4.4 delivers 5.5g of BCAAs (Branched Chain Amino Acids) that promotes protein synthesis and prevents the unwanted breakdown of muscle tissue. Casein Fusion 4.4 also provides 5g of Glutamine per serving. Whenever you subject your body to intense exercise, your glutamine levels drop dramatically. This slows muscle growth and recovery, and weakens your immune defense. Casein Fusion 4.4 steadily restores your Glutamine levels back to normal so you can enjoy optimal muscle recovery and development. SAN Nutrition covers your need for a slow-digesting, complete protein source with 100% Casein Fusion 4.4! Have a question about 100% Casein Fusion 4.4? What is it, what does it do, how and when to use or something else? Ask us. “100% Casein Fusion 2.2 1008 grams” is currently out of stock. Enter your details below and we will let you know when it's back in stock. ALLERGEN INFORMATION: Contains Milk And Soybean. Add 1 scoop in 10 – 12 oz. (300-360 mL) of water/milk anytime of the day to satisfy your nutritional program requirements. Consume 1 serving daily. WARNINGS 100% Casein Fusion 4.4 : These statements have not been evaluated by the Food and Drug Administration. This product is not intended to diagnose, treat, cure, or prevent any disease.